This is a quick way to create a tasty baked variation of teriyaki pork. A great main dish for a busy weeknight or fast paced weekend. Requires some advance preparation for marinading for the best flavor. Mix all ingredients, except the meat, in a saucepan or microwavable bowl. Heat until sugar dissolves. Add cooled marinade to meat and marinade for 1 to 8 hours in the refrigerator. Bake at 375F until cooked through. 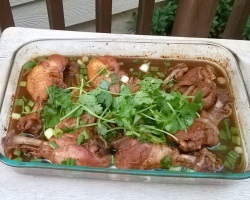 Once cooked, cut into bite sized pieces and garnish with chopped green onions or cilantro. Serve with warm rice and some salad.